By default, there are 4 tabs of pre-defined information for each registered user in PHPFox. They are Basic Information, About Me, Interests and Details. However, you may want to change those and even add some custom tabs that will allow you to group the information for each user a certain way. The Basic Information field is non-editable. This means that the information in it is required for all of the customers on your website. There are certain fields on the Basic Information tab that you can disable, such as the relationship status, however, the actual tab is required. To remove it, you will have to hire a certified web developer that can assist you on that, but the Support service of your PHPFox website will no longer be available after code modifications of your product. When saying that, make sure that you are fully aware of the complications this may bring on your table, before customizing PHPFox code. However, the rest of the tabs are editable. You can even add additional ones to your website and group certain features together for better understanding. After all, we need to make things easier for our customers so their experience on the website is as pleasant as possible. Select the User button from the top menu and then Custom Fields > Add Custom Group. Product: Choose Core from the drop-down box. Module: Select the Custom module as this is a custom group. Location: Choose Users Profile as the only available location with a default installation. Group: Enter the name of the new custom group/tab. 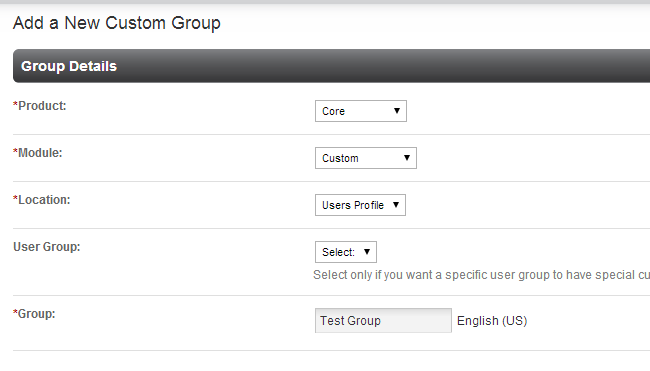 User Group: Now, if you wish, you can apply the custom tab for a specific User Group or for all of them. You need to enable custom tab visibility for the user group you are applying it to. You can review our tutorial on how to manage PHPFox user groups. 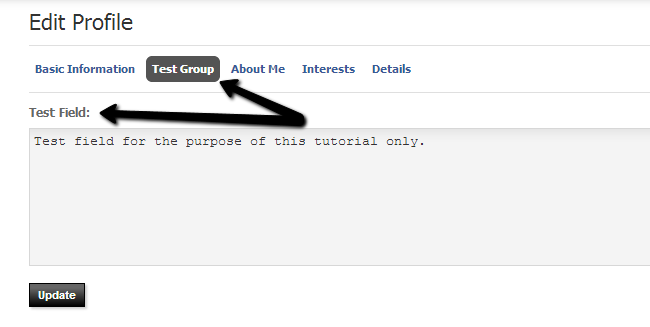 Click on the Submit button to create the new group/tab. For the purpose of this tutorial, we have accessed the admin profile on our website. We have also created a test field in it. To create one yourself, you can review our tutorial on how to add custom fields in PHPFox.